A week of cold and blustery wind and dribbling sunshine. The garden has fully recovered from the dry summer. For a long time after the first autumn rains the ground remained dry an inch or two down but now I have more sense than to dig. I wish I could say the same about the badgers who are feasting on worms in the wet grass and tearing up the turf in the process. I don't have any high quality grass, the shade of trees and a steep slope keep me from getting obsessisve about lawns but I struggle to keep a ragged green cover on the paths. I struggle but I don't really succeed. I get an occasional glimpse of a badgers backside which is small compensation for all the earthworks. In theory the reduction of the earthworm population is a disadvantage as well but worms are difficult to love. I started the process of bring plants under cover last week to prepare for winter. It always seems much worse at this time of the year than it does when the cold weather actually hits. By then it is too late and it is easy to be sanguine. Even easier to stay indoors by the fire and not have to look at it. Winter rolls onwards however. 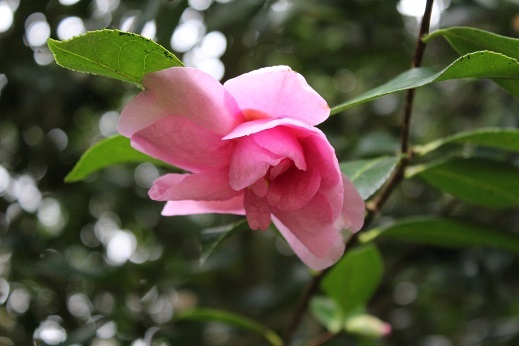 There are fattening buds on the Camellia and a few autumn bloomers but it is far too early for 'Show Girl'. I checked last week just to be sure, and there was nothing. I don't expect to see it until the end of December. It is a little seasonal present that says spring is coming. First flowers this week suggest that it will be an early year. At this rate we can expect spring by the end of January. Predicting the seasons on the basis of a few flowers is a dodgy process much like reading the runes or examining the entrails of a chicken. If I get a taste for it I might try reading the future in worms. Evergreen shrubs add important mass to the garden through the winter. I have plenty of large conifers and they have a comfortable quality around the place. Soft and woollen with blurred edges and gently nodding heads. I have plenty of blobby Camellia filling the space below. Without them the garden would be as empty in winter as an abandoned warehouse with fallen leaves blowing around. The shapes of the garden work through the summer and encourage me to wander around rather than worry about all the things that need doing. In winter everything changes. The large trees shed their leaves and the garden becomes unexpectedly bright. The evergreens have to add texture and drama to the scene as well as define space. It is a challenge to find things that that aren't round, fine and blurred. 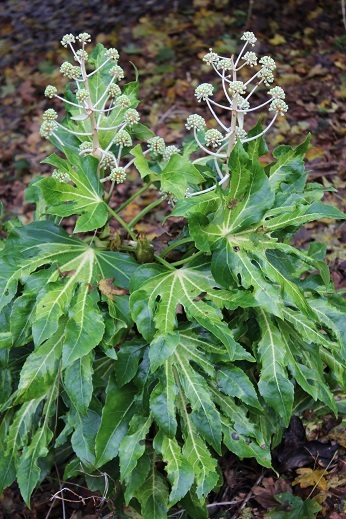 Fatsia has large leaves that grow in upright sheaves from the stumpy stems. As they mature they develop grey trunks and look like small trees rather than large shrubs. 'Annelise' has a bold splash of lime green in the centre of the leaf and I'm not quite sure if it adds or detracts from the effect. If in doubt, plant it and see what happens. I put a small plant in to fill the space behind some Camellia and it has grown surprisingly rapidly. In a decade there will be enough shrub to make an assessment. In the meantime the white flower spikes are striking. 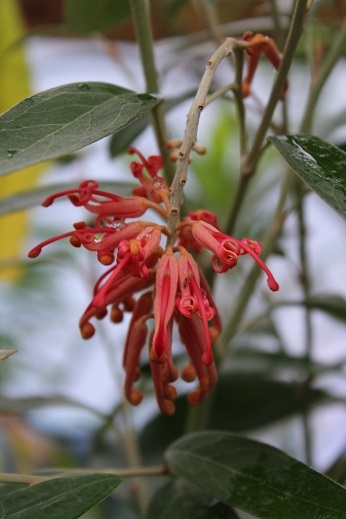 This Grevillea is another example of the "plant now and sort it out later" philosophy. I was given a young plant a couple of years ago that had suffered for too long in a small pot. I planted it in the Agave house, knowing that Grevillea prefer light and warmth and it has grown. Next year it will be pushing at the roof, and decisions will have to be made. It is probably time to take cuttings and make sure that I have a spare. In a couple of years I have become very fond of it. The silvery leaves catch the light in a more interesting way than an Elaeagnus (for example). It ends the year with an invasion of foxy red spider flowers crawling around the tips of the branches. I am going to attempt lifting this one and planting it outside. Grevillea do not generally appreciate being moved but this one has been through a lot already, and it might forgive one last indignity. If the cuttings don't root, and the plant doesn't survive the move, then I will replace it because I haven't yet had my fill. It is easy to stay in the Agave house at this time of the year. Last week I came up to plant a cactus and stayed all day. A lot of things that were probably important didn't get done as a result but I did manage to weed the Agave house from end to end. It has needed doing for months and I keep avoiding it. Agave are prickly things and I never seem to have a pair of stout gloves to hand when I need them. The intention of the Agave house was to provide a dry environment and allow the Agave to escape the tiny pots they had struggled in for many years. A few other succulents crept in once they were planted. Followed by some cacti. And then the flood gates opened and the greenhouse filled up with all the warmth lovers and frost haters. Finally, the last spaces were filled with some things that were just homeless. Eventually I will have to step in and move some of less appropriate occupants out. I had assumed that last winter would thin out the space a bit and that I could smile and accept the losses. Winter is a fickle thing. Last year it didn't happen and now the greenhouse is looking crowded. All the plants are larger. If winter kills them now the loss will be felt a little more keenly ( and then I will accept the losses). This Pericallis was a gift as a seedling and it took a long time to fill a small pot. It looked sad every time it was watered and stopped growing. Then there would be a small window of growth, perhaps a new leaf would expand before it wilted and the cycle started again. I have no idea how it survived the first two years. I learnt to keep it dry but it survived rather than grew. Once I had a space in the Agave house it was planted out. It grows in the moist mountain forests of northern Tenerife so I wasn't expecting it to appreciate the hot dry conditions or the potential for frost but there was one great advantage. It is at the far end of the garden so I wouldn't have to watch it die slowly. In the event it hasn't died at all. Given a free root run it has taken off and not looked back. 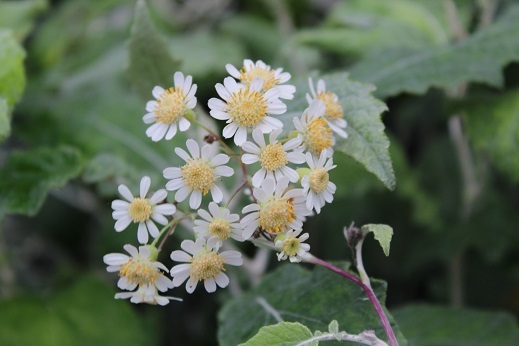 It started flowering in spring and has continued right through the summer swamping the surrounding plants with large soft grey leaves. Beyond all expectations, it will need cutting back. If it survives the winter, that will be a celebration job for the first warm day of spring.